Generation to Generation - Made by Kym: Knitting… how hard can it be? The answer is… not very, as long as you know where to look for help. I can’t resist a good ball of yarn. In any haberdashery I am always drawn to them… aren’t you? When sewing isn’t enough for me I pick up my knitting needles and have a go. A few years ago I was working in a hotel in Sherwood Forest and didn’t have my sewing machine with me. I was doing a lot of cross stitch but fancied giving something else ago. There was a lovely little shop called Craft Corner (http://www.craft-corner.net/) nearby and I went there for some inspiration. It was here I bought my first knitting needles and yarn and thought, “Knitting… how hard can that be?” It was a beautiful chunky velvet spun yarn in plum (my favourite colour at the time) to make a scarf. The lady in the shop was very helpful and pointed out that this was perfect for a beginner as the yarn wasn’t too fiddly. Here came the tricky bit…. Actually teaching myself how to knit. You Tube is the best invention for learning new skills and after watching numerous videos and muttering “I don’t get it” at the screen a few times, I had managed to cast on and I was knitting away! It took me ages to finish the scarf, I wanted it to be perfect. I soon learned that I didn’t need to pull the tension too tight as I was finding it difficult to push the needles through. Once I finished scarf number one I was straight back to Craft Corner for another ball. I loved the velvet yarn so much that I got a second in red this time to make a scarf for my Mam, Christmas was coming up. It was just ‘knit every stitch’ once again but this was fine with me, practice makes perfect. After this I started to buy knitting magazines and tried to figure out the patterns in them myself. A great way to learn new stitches. I learned to purl (thank you You Tube) and discovered different textures that could be created. The magazines were really helpful as they showed me that not all patterns are complicated and if there was ever anything on them that I didn’t understand it usually explained it at the back of the publication or a few clicks on the internet and someone helpful on You Tube was taking me though it step by step. Much more recently I had a fantastic day out at Kirsty Allsopp’s Handmade Fair at Hampton Court. I had had a bit of a break from my knitting projects as my sewing was taking up most of my free time. 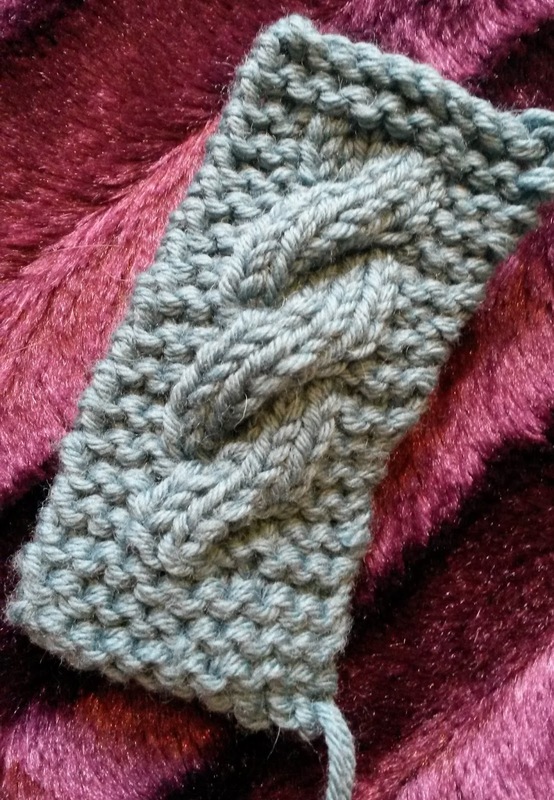 I booked myself onto the Intermediate Knitting skills workshop with the lovely Suzie Johnson. I have to admit I was a little out of my depth to begin with, however with a little perseverance and a lot of help from the lovely ladies there I was feeling much more confidant. I learned to cable. This I was most excited to learn as I love the look of a cabled knit… so pretty. 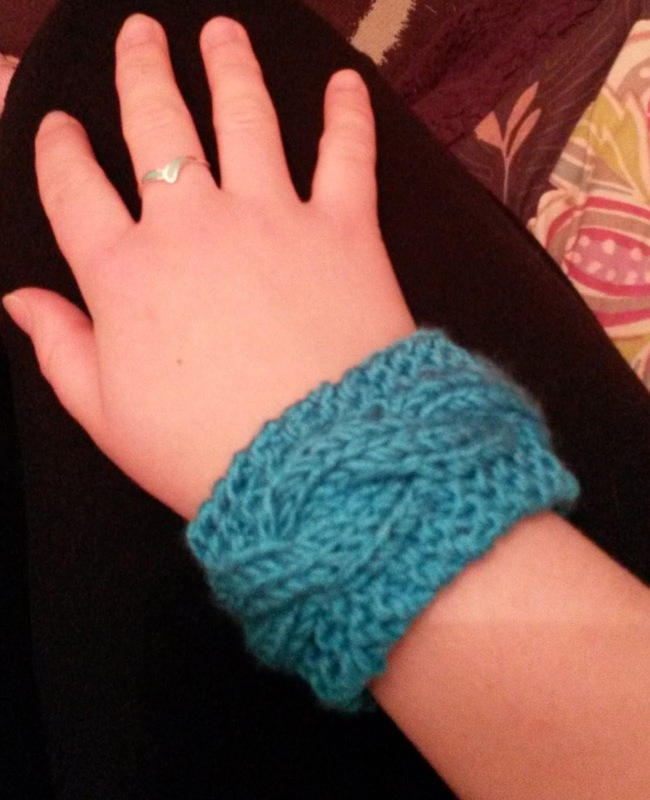 Unfortunately I didn’t manage to finish the bracelet we were making in the workshop… however I came away with a lovely cabled napkin ring! I couldn’t wait to try out my newly acquired skills again at home and stayed up quite late that night making my cabled bracelet so I could wear it with pride the next day at work. It didn’t matter that I was a little sleepy… my new piece of jewellery looked awesome! The workshop 100% rekindled my love for knitting and have started looking into more complex patterns. I am hoping to make a selection of knitted Christmas gifts for friends and family this year... watch this space.